Oprah Winfrey (left) holds a town hall-style interview with Democratic gubernatorial candidate Stacey Abrams in Cobb County on Thursday. Oprah Winfrey is no stranger to Atlanta. Recent visits have involved her role in Greenleaf (the Georgia-filmed OWN network mega-church drama in which she acts and produces), her business dealings with entertainment execs such as Will Packer and Tyler Perry, and debuting new content in front of popular local influencers including Imara Canady, Rose Scott, and Ray Cornelius. But when the media mogul made her way to the metro area this week, she arrived with one purpose: to boost the profile of Georgia gubernatorial candidate Stacey Abrams in the final days before the election on November 6. 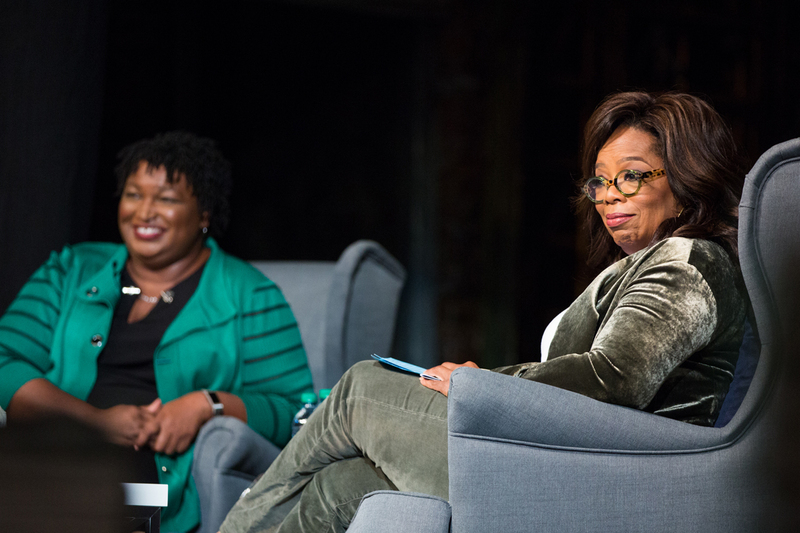 In two town hall-style meetings in Marietta and Decatur Thursday afternoon, Oprah brought international attention to the razor-thin poll margins between the Democrat Abrams and her Republican opponent, current Georgia Secretary of State Brian Kemp. The beloved TV host and Oscar winner switched focus away from this year’s divisive campaign ads and instead asked audience members to “vote your values” without regard to party affiliation. Oprah does not take campaigning lightly; she stumped for former President Barack Obama in 2008 but didn’t hit the road for Hillary Clinton in 2016. Her support can provide a big bump in votes, too: two University of Maryland researchers estimated her influence on Obama’s 2008 presidential primary race to be worth around one million votes. In Georgia, she primed the stage for an ebullient Abrams, who spoke confidently to the majority-female gathering about her agenda to expand Medicaid, protect rural hospitals, improve education statewide, and advocate for common-sense gun laws. Publications as geographically and ideologically diverse as the Guardian, Fox News, Variety, the Hill, and others ran stories or segments about Oprah’s door-knocking and campaign appearances with Abrams; yet regardless of the depth of coverage, the two events held in auditoriums in the Atlanta suburbs likely impacted the local crowds (which together totaled approximately 1,000 attendees who’d received an email invitation) in a much deeper way than what could be conveyed to national viewers on the NBC Nightly News, for example. Here’s why the exchange between the two women was so powerful: First, the place and setting mattered. 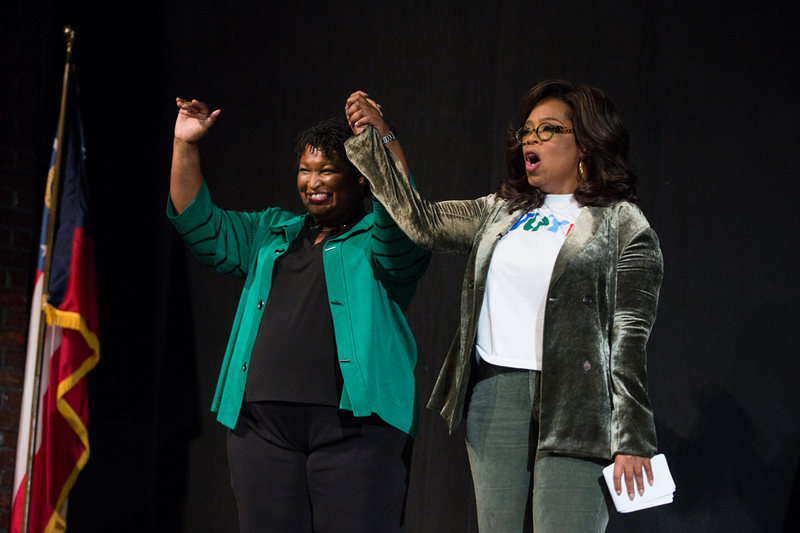 I attended the day’s first event in Marietta, where Oprah and Abrams came to the suburbs to speak to voters like me on our own turf—and got a glimpse of the Georgia we live and work in every day. Cobb’s reputation could be better: it’s widely criticized for its rejection of the MARTA system in 1971, for being in what the New York Times in 1994 labeled as a “suburban Eden where the right rules,” and for luring the Atlanta Braves to the suburbs with hotly debated tax funding in 2013. Yet Cobb is also among the metro Atlanta’s most diverse counties, and the political demographics seem to be shifting—Hillary Clinton won more votes here than Donald Trump in the 2016 presidential election. In spite of how other parts of the country might view the suburban district, the hundreds of chatting women (ranging from college students and young moms with infants to women in business suits and an elderly lady in a wheelchair) who lined up at the Cobb County Civic Center to hear Oprah interview Abrams, who could become both the state’s first female governor and the country’s first black female governor, represented a reality of life in Georgia in which the statistics and headlines sometimes don’t capture. Inside the event at the Jennie T. Anderson Theatre, an empty podium stood in the center of the stage, along with two poles bearing the Georgia and American flags respectively, flanked by a pair of faux brick warehouse facades and scaffolds in front of a backdrop of the Brooklyn Bridge—part of an immovable set from the ongoing run of the Atlanta Lyric Theatre’s production of the musical Newsies. The irony was not lost on this journalist that a stage where the stories of child laborers who worked for sensationalist publishing giants Joseph Pulitzer and William Randolph Hearst were being told nightly was echoed, by proxy, during an optimistic political rally led by two women who have publicly denounced lies, deception, and media bias at a time when the president refers to the press as “the enemy of the people” and many newspapers around the country are gasping their last breaths. The world’s eyes were also watching Georgia on Friday, when former President Barack Obama spoke at a separate Abrams campaign rally at Morehouse College in Atlanta. Yet the Thursday chats between Oprah and Abrams seemed designed to strike a chord with the women in the audience, primarily because the discussions deliberately handled race with a frank and regionally-sensitive tone. Southerners do not like to read or hear about life in the South from outsiders. In this case, Oprah and Abrams were able to discuss their Mississippi childhoods in front of audiences that felt like family. The flurry of media soundbites published immediately following the end of the Marietta event lauded Oprah’s powerful statements about her status as a registered Independent and her belief in a duty to honor ancestors who did not have the right to vote, whether they were deprived because of their gender or the color of their skin. Yet few reports expounded upon the significance of Abrams’s historic campaign in a state where the capital city served as a cradle for the civil rights movement. Most of the press likely noticed basketball star Charles Barkley taking selfies with audience members or Atlanta Mayor Keisha Lance Bottoms and Democratic lieutenant governor candidate Sarah Riggs Amico waving to the crowd before the event started, but some may have overlooked the presence of the curly-headed gentleman seated on the front row—C.T. Vivian, a civil rights activist who, like Lewis, was a close associate of Martin Luther King, Jr. Newcomers to Atlanta quickly learn there is an unspoken code that requires every worthwhile political deliberation must begin and end with preserving the legacies of the city’s heroes. This event worked because Oprah understood this rule explicitly. Outside the theater, the conversations held in line by groups of women—many of whom had arrived alone but quickly made friends as they waited for an hour or more to enter the venue—were not about the South as a place apart, or about women feeling like they’re inferior or limited by the complicated history of their geography. Instead the discussion revolved around how to move forward and do the best they can for their children, schools, hospitals, companies, and about reinserting common decency and hope for the future back into American discourse and politics. They agreed that a magnanimous celebrity like Oprah brings excitement and unity to any event. But right now in Georgia, Stacey Abrams is the only one who can bring their victory home.